Of all the world’s capitals, namely Tokyo, different unique personality and appeal. The peculiar character of the city gives the close proximity of the ancient traditions with the modern pace of life, progress, going hand in hand with centuries-old foundations. As the population of Tokyo is superior to all other cities in Japan – in the capital is home to 10% of the total population. It is concentrated in Tokyo, all the most attractive tourist – cultural monuments, museums and exhibition centers, interesting excursions, superb leisure. Sightseeing of the Japanese capital’s best to start with the Imperial Palace, known as Edo Castle . 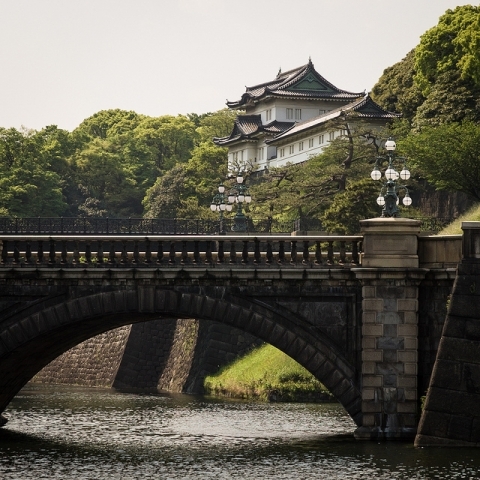 This palace is described in the best works of Japanese literature and is a real fortress, surrounded by a deep moat. You can get inside the palace, passing through the elegant bridge Nidzyubasi, about the time the tour is better to agree in advance, as tours are offered on certain days. Visiting the palace is impossible not to stay in a beautiful garden, which is located in the courtyard. The harmony of nature with the ancient buildings, the abundance of diverse vegetation and the ruins of the ancient tower Higashi Guéhenno – the perfect backdrop for relaxation and reflection. 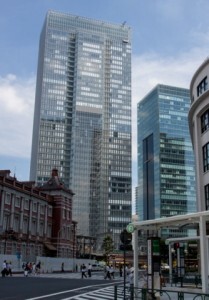 If you start a walk in Tokyo from the station, in the immediate vicinity, you can see one of the historical relics – Marunouchi skyscraper , commonly known in the world as a building World-Bireh . This shopping mall, where you can find a lot of interesting things. A short walk from the train station – and we are in the area of Ginza – the center of the Japanese capital, known for the most expensive shops and restaurants. Particularly attractive area of Ginza becomes night, when lit thousands of neon lights. It is also the Kabuki theater, one of the gems of Japanese culture. To plunge into the calm in the midst of the bustle of the big city can be in Ueno Park , the largest leisure park in the Japanese capital. In the spring, in early April, when the cherry blossoms, it is Ueno Park becomes the most attractive place of Tokyo. Where thousands of people gather as residents of the capital and tourists who want to enjoy the beauty of the main Japanese tree in the flowering period. There is an art “admiring sakura” – Hanami . The area of the same name – Ueno, surrounding park, rich in museums and cultural centers. 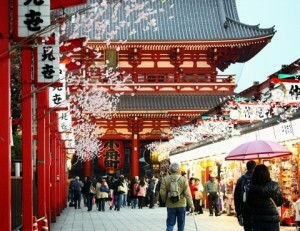 The oldest area of the city is Asakusa . Here you can buy a lot of traditional Japanese souvenirs, from dolls to kimono. Lots of shops and stores sell traditional goods it. Asakusa allow you to see the ancient Buddhist temple of Asakusa Kannon , majestic and beautiful. Shinjuku District , which is adjacent to the Tokyo Opera. It is the center of the club life, luxury shopping. 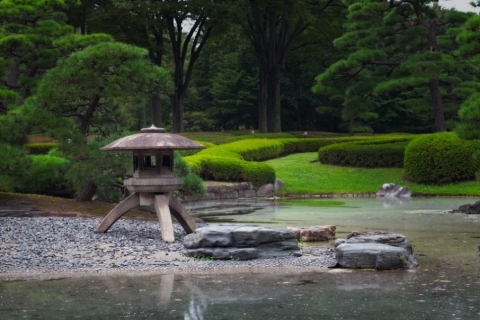 You can here and relax, enjoying the quiet of a beautiful park Shinjuku Gyoen. Shibuya – the perfect place for the young and active tourists who are interested in contemporary Japanese trends. It is the center of fashion, shopping, fun and entertainment. There are many shops side by side with cozy cafes and restaurants, where you can relax with friends. Shibuya – one of the most interesting places of the Japanese capital. Odaiba is located near the port of Tokyo, and here you can enjoy spectacular views of the city.This is where the world-famous Ferris wheel, ride on which must each guest capital – views that open from the top, breathtakingly beautiful. 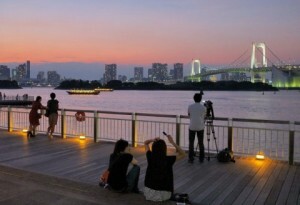 In addition, Odaiba offers many shops and a famous center SPA – Oedo-Onsen Monogatari. Excursions in the vicinity of Tokyo are exciting and varied. 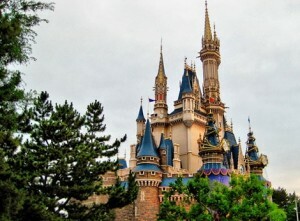 Tokyo Disneyland is known worldwide and attracts children and young people as a magnet. It is located in the Maihama area, and getting there is not difficult – you need to drive to the station on the train no more than 20 minutes. A variety of entertainment for children and adults offered by Disneyland, will not leave anyone indifferent. Yokohama – the second largest among Japanese cities, is of great interest for tourists. You can get there by train from Tokyo Station, the road will take no more than half an hour. This port city, with plenty of entertainment, shopping and dining. Yokohama Restaurants are renowned for excellent cuisine and original menu. Kamakura – a small town with a large number of ancient Buddhist temples, the quiet and picturesque. It is located one hour by train from Tokyo Station. It Kamakura from the 12th century was considered the capital of the Japanese Shogunate. 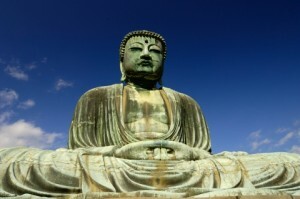 Of particular interest is a hugestatue of Buddha, more than 11 meters in height and 120 tons in weight. All the temples are decorated with an abundance of flowers that lends sophistication to ancient buildings. Walk among the town of Kamakura temples will be the most pleasant memories of the tour in Japan, you are completely immersed in the atmosphere of the 12th century, you will feel a part of a great past. Hakone – resort town, which is part of the famous National Park, Japan – Fuji-Hakone-Izu National Park . The journey from Tokyo to Hakone will take half an hour by train. There is a museum of sculptures exhibited in the open air. Hakone offers tourists a lot of hot springs, stunning views of Mount Fuji, walking on the lake Asi on water transport. You can not only relax, but also to heal your body. Fuji – Japan’s most famous mountain, which is always the center of any artistic composition or literary creation. The height of Mount Fuji 3776 meters above sea level. Climbing the mountain – one of the most interesting excursions. The best time for climbing is during the summer months – July and August. 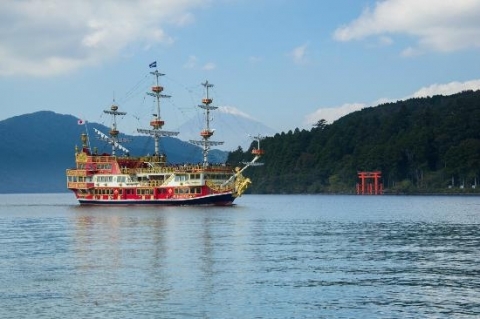 Excursions at Fuji offer the opportunity to enjoy the view of the five lakes , take a swim in their quiet waters, fishing and relaxation from the bustle of the city. Nikko small town a couple of hours drive from Tokyo. Here, ancient temples side by side with stunning natural landscapes. Temple Tosegu belonging to the Shinto religion, is of particular interest. It is adjacent to another major attraction – the mausoleum of the Tokugawa . Luxury architecture coexists here with a rich history of each stone. Izu – peninsula, located just south of Hakone. Here are the famous therapeutic and recreational resorts, rich hot springs, majestic waterfalls, with plenty of greenery and beautiful mountain scenery. Izu is made ​​up of seven separate islands, each of which is a resort complex. Travel to island resorts is not limited – you can spend a day or a week, depending on your desires. The path to the Izu Peninsula Tokyo on water takes half an hour. Way on the bus longer – about four hours.The most prestigious resort is Kusatsu Onsen , famous for its healing mineral waters. If you throw a coin into the mineral source, it is completely dissolved in a few days. The healing properties of spa waters make it popular among those who prefer to combine rest with health benefits. 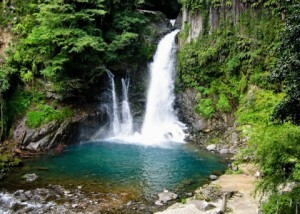 Japan is very rich in natural springs of mineral and thermal waters. A hot bath in a natural rock recess – this is one of the most popular services of Japanese resorts. Many sources of more than two thousand years. It attracts a huge number of tourists to the hot springs in Japan year after year. 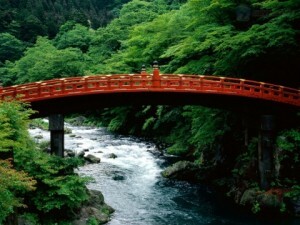 Tours to Japan presented the opportunity to fully enjoy all the gifts of the Japanese nature and relaxation.